After criticising an established ELT website last week I wasn’t prepared for the negative reaction I would get. My criticisms were not all valid, but I believe that some were and I stand by them. But let’s leave that aside for a moment. In this post I’m going to talk about my ‘3 questions for ELT’. Critical thinking essentially means having a questioning, challenging, analytical state of mind. A critical mind is comfortable with a degree of scepticism and doubt; it is a mind that is open to reinterpreting and refining its knowledge, and accepting that what we know may change in the light of new knowledge. how can we foster critical thinking in our learners when we can’t do it ourselves!? I had the idea for a ‘Teachers as Workers’ SIG within IATEFL (see “The ‘V’ moment post”). The spirit of the idea was merely to ‘have a conversation about working conditions in ELT’. Nicola Prentis of Simple English mentioned this on her blog, we exchanged ideas and she then put together a proposal for a ‘Teachers as Workers’ SIG within IATEFL. This was then submitted to IATEFL and overwhelmingly rejected. One of the reasons was that this idea did not count as ‘professional development’. 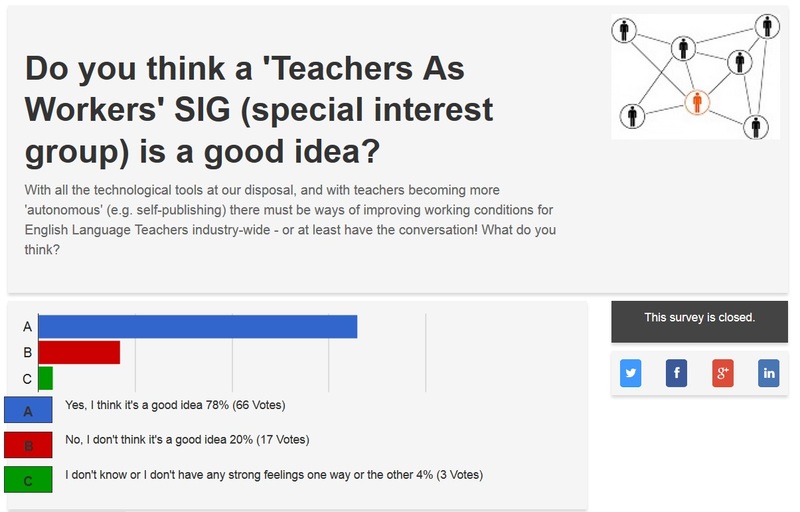 I also conducted a twitter poll around the same time in which teachers voted overwhelming in favour of the idea. In Argument 1, the conclusion only follows on from the premise if you say that ‘All teachers who don’t like their working conditions have the power and resources to leave their employers’. And this is patently false. What about teachers with families? Or those tied to a contract with an ‘end-of-year’ bonus? 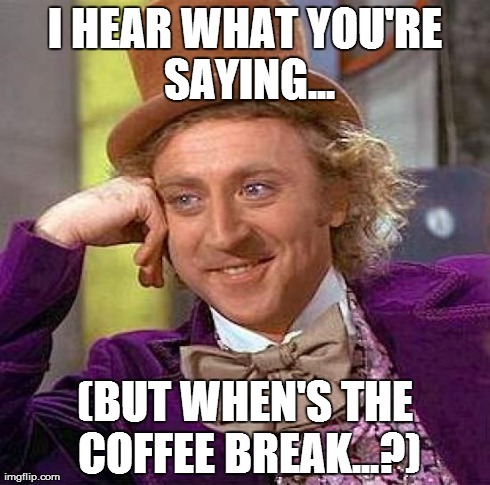 In Argument 2, there is no logical connection between the task being complicated and never being achievable. Just because a task is complicated is not a reason it will fail. If this was true we wouldn’t have constitutions, DIY or spaceships. Whenever I bring up the idea of examining working conditions, I have the same uncritical ‘arguments’ thrown at me again and again. And they are based on the hidden assumption or belief that nothing needs to change. This is uncritical and dogmatic – the very opposite of what we are supposed to foster in our learners! But you just have a chip on your shoulder! This is a cheap way of silencing criticism. If you get angry about something and want change, you have a chip on your shoulder. Then no one needs to listen to you anymore. I think that a more productive way of looking at this is Fixed versus Growth mindsets. The psychologist Carol Dweck in her book Mindset: The New Psychology of Success states that our ‘mindsets’, the basic beliefs we carry, can profoundly affect our lives. A Fixed mindset assumes that phenomena such as character and creative ability are fixed and static and that we can’t change them; therefore success is an affirmation of these fixed qualities (like IQ). A Fixed mindset often gives up when presented with obstacles, challenges are to be avoided and they tend to be threatened by the success of others. A Growth mindset does not give up when presented with obstacles, embraces challenges and finds inspiration in the success of others. A Growth mindset is resilient. My third and final question. In order for us to become 21st century teachers don’t we need to adopt a Growth mindset? Where do I find the people who have a growth mindset – if not in ELT? 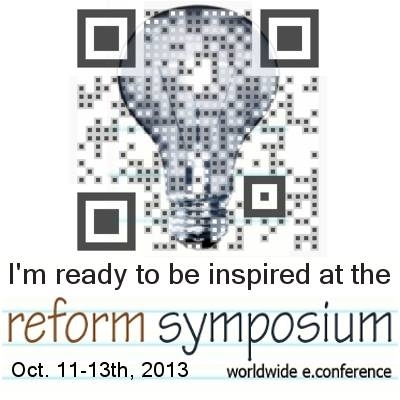 Reform Symposium 2014! I mentioned anger at the start of this post. Why am I angry? I am angry because I’m passionate about something: about education, about injustice in the world, about politics. On a local level I’m angry that there’s so much deference and fear in my ELT community: ‘don’t offend the wrong people’, ‘you’ll never get another job if you say that’, ‘you’ll be blacklisted if you criticise the schools here’. A community that perpetuates this kind of thing is NOT a professional community that I want to be a part of, or a community fit for the challenges of the 21st century. After a terrible week, and while sitting at my desk marking dozens of test papers I stumbled across the amazing Reform Symposium 2014. I spent the entire weekend listening to the amazing presenters (such as this one by Amy Burvall on RemixED: The Power of Remix, Mashup, and Recontextualization in the Classroom) and moderators who gave their time for free (!!). I was especially struck by Shelly Terrell’s tearful, angry and passionate comments on Sunday saying that (and I’m paraphrasing) ‘if you’re not passionate about what you do then you shouldn’t be teaching’. If anger is driven by passion then what’s wrong with that? Anger is the oldest disruptive technology in the world! This is not the same as complaining, which I have been accused of. Complaining is a slow, seeping out of resentment which no one wants to be around. But anger is something completely different. But this is something I rarely feel in ELT. This is the future: Share. Decentralise. Adopt a ‘growth’ mindset. Follow the free. nice try with ITAFEL SIG thing, it forms part of the struggle for better working conditions. “struggle” is a grounded, honest way to see things in general i think. certainly anger will at times help in the struggle! what was the website you criticised? Lots of good for thought, thank you! This entry was posted on July 15, 2014 by paulwalsh in For Teachers and tagged anger, Change, criticalthinking, decentralise, decentralize, dogmatic, educator, ELT, free, growthmindset, pedagogy, resilience, RSCON2014, sharing.